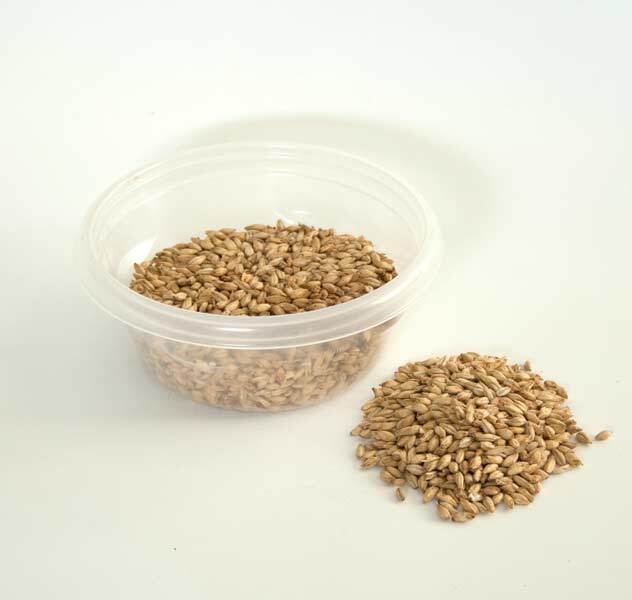 All our malts and grains are suitable for both full grain brewing and as an addition to a beer kit. Some grains must be mashed, others can be steeped. Refer to the description included with each grain. If your recipe calls for a specific brand and/or type of malt not listed here, please refer to the Brewing Grain Substitution Chart to find a suitable substitute. Order this option if you would like your brewing grains crushed. Please use the "remarks" field in the order form (which you will fill out once your order is complete) to specify whether you want all your grains crushed or only a part of them, and whether the crushed grains can be packaged together (i.e. mixed and ready for brewing) or must be packaged separately. Note: free crushing of grains is limited to orders of up to 15 kg. of grains per customer. For larger quantities a nominal crushing fee will be charged. No grains other than those bought at Brew for Africa will be crushed. Also keep in mind that uncrushed malt has a decent shelf life when stored dry in a closed container, but crushed malt should ideally be used within a few days. A deep, dark, fully roasted malt that, if used properly, can lend a very dark colour and intense toasted flavour to dark beer styles such as stouts and Schwarzbier, and can be used to limit the sweetness of other styles that contain a lot of crystal malt. Typically imparts a highly roasted flavor, as well as some bitterness and acidity, and gives deep contrast to a round malty beer. Use sparingly! 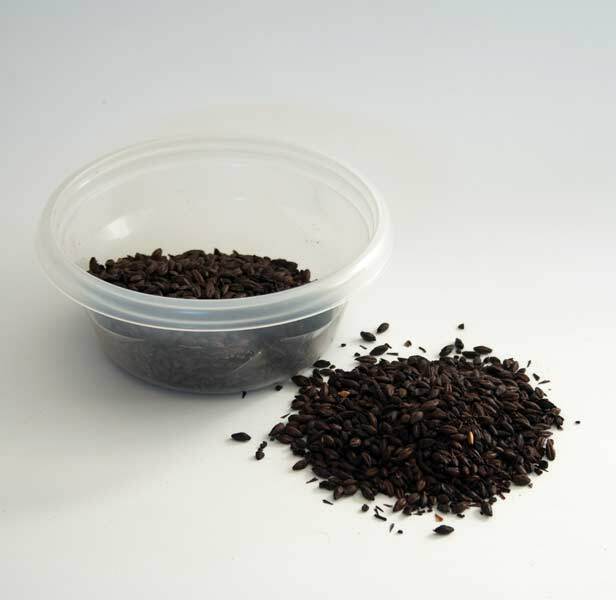 If used in excess, black malt can lend a very sharp, acrid, burnt (sometimes even ashy) flavour with a harshness far beyond that of both chocolate malt and roasted barley. Can be either steeped, or mashed along with other malts. Can be used as a substitute for any black (patent) malt, including Carafa type III. This light to medium crystal malt intensifies the aroma and color of darker beers, particularly German Alt, stouts, bocks and porters, but can also be a good ingredient for a variety of English and Belgian ales. This is a crystal malt which can be steeped and does not need mashing (but can be mashed along with other base malts). This light to medium crystal malt (not to be confused with the Munich base malt) has a deep gold to pale copper colour. It adds a sweet malty flavor and aroma to a variety of beer styles. This is a crystal malt which can be steeped and does not need mashing (but can be mashed along with other base malts). Can be used as a substitute for Crystal 30 malt. 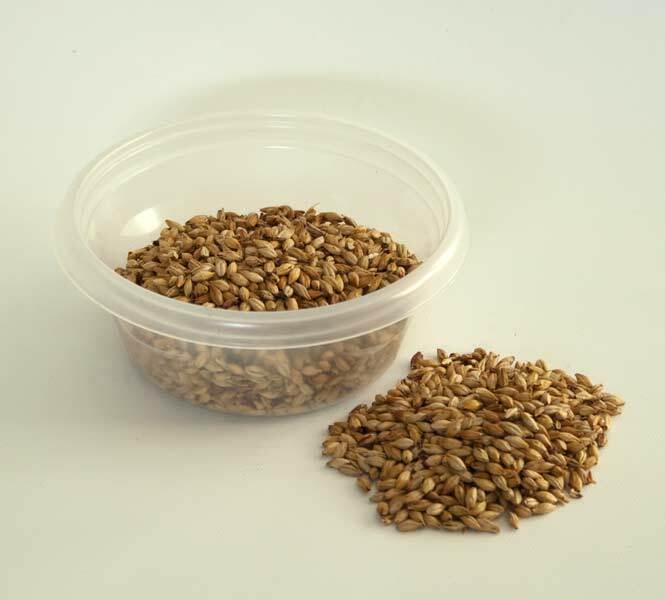 This medium crystal malt (not to be confused with the Munich base malt, with which it has nothing to do) is one of the most popular crystal malts. It has a deep colour and adds a mild toasty and sweet flavour to a variety of beer styles. This is a crystal malt which can be steeped and does not need mashing (but can be mashed along with other base malts). Can be used as a substitute for Briess Crystal 40 malt, Dingemans Caramalt 45, Fawcett 40-50 Crystal malt, medium caramel malt and similar malts. This medium crystal malt is one of the most commonly used caramel and crystal malts. Not to be confused with the Munich base malt, with which it has nothing to do. It adds a measurable sweetness and caramel flavor to a variety of beer styles. Well suited for many English, Belgian and American style milds, porters, stouts and bitters, and is often used in small quantities to adjust the flavour and colour balance of just about any type of beer. This is a crystal malt which can be steeped and does not need mashing (but can be mashed along with other base malts). Can be used as a substitute for Briess Crystal 60, Medium Crystal malt, Fawcett Dark Crystal type 1, Medium Caramel malt and Caramel Munich. Dextrin malt gives a fuller body and mouthfeel to light beer styles (e.g. Pilsner, lager or Bock) and significantly improves head formation and retention. Use in small quantities (typically 3-5%), as it can cause a cloying, sugary sweetness if used in excess. This is a crystal malt which can be steeped and does not need mashing (but can be mashed along with other base malts). However, when steeped this malt may introduce unconverted starches in the wort. Most of these may disappear during boiling, but your mileage may vary. Replaces (and improves on) the older CaraFoam malt, and can be used at a substitute for any dextrin malt including Briess Dextrine. Carared is a light dark crystal malt, for any beer in which a reddish color is desired, such as Scottish Ales, Belgian ales, a variety of English ales, and Bocks. It also provides a full body and a nice, malty aroma to the beer. This is a crystal malt which can be steeped and does not need mashing (but can be mashed along with other base malts). May be used as a subsitute for Briess Crystal 20, Castel Cara-ruby or Castel Biscuit malt, and Cara-vienne. Biscuit malt is unique among malts. Along with the American Briess Victory® malt, for which it is an excellent replacement, this is the only base malt that can also be steeped in small quantities to lend a wonderful malty character to extract-based brews. Biscuit malt is a Belgian malt, so it is excellently suited to give many Belgian ales their typical character, but it also works brilliantly in many English and American ales. This lightly kilned malt is known for its lovely sweetish biscuit-like aroma and flavour, and after crystal malt this is perhaps the most frequently used speciality malt. Can be used as a substitute for American Briess Victory® malt. A deep dark-brown, roasted malt that adds a distinct bitter-sweet "chocolate" flavour with nutty and toasty notes to the brew. Less bitter, less toasty and slightly less dark than black malt. Use sparingly for brown ales, and more extensively for porters and stouts. Add to pale malt according to recipe. This is a crystal malt which can be steeped and does not need mashing (but can be mashed along with other base malts). Can be used as a substitute for any chocolate malt, as well as for Carafa II. A very aromatic malt, with intense malty flavour. Gives fullness and roundness to the beer colour, improves flavour stability and gives beer a fuller body. Use in amber and dark ales, and in red coloured beers like Scottish ales, amber ales, red ales, and Irish ales. Use up to a maximum of 20% of the entire grain bill. This is a base malt which must be mashed. Can be used as a substitute for Briess Victory malt, Pauls and Fawcett Amber malt, and Aromatic malt. A rich, golden malt that provides a modest colour increase toward a nice, golden-orange tint. Adds a pronounced grainy, malty flavour to many beer styles without affecting the foam stability and body. Also used in small quantities in combination with Pilsener malt to produce light coloured beers, improving the malty flavour and giving the beer a richer colour. Enhances the taste of character beers. 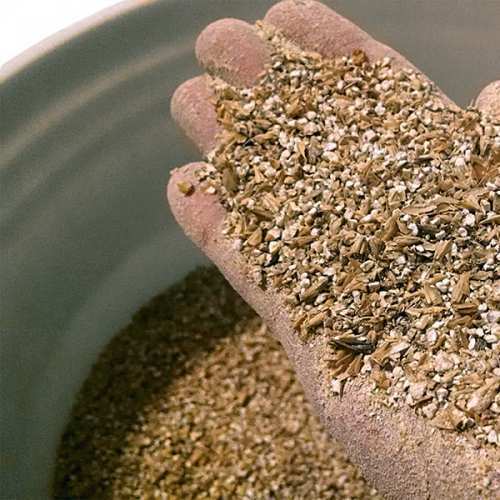 Used in pale ales and in amber, brown, strong and dark beers in quantities up to 60% of the total grain bill. Can be used as a substitute for any brand of Munich Malt. This is a base malt with a relatively low diastatic power which must be mashed in combination with other malts. Pale Ale malt, not to be confused with regular pale malt, is an excellent basis for a variety of ales, especially British styles. A little darker than regular pale malt, it has a slightly fuller, nuttier and maltier taste, which lends great character to pale and brown ales, porters and similar styles. This is a base malt which must be mashed. 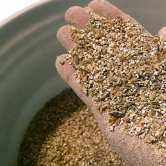 Pale malt forms the basis of just about any beer, and usually makes up the bulk of the grain bill. The name comes from the fact that pale lagers are the most common style of beer and this is the malt type most commonly used to produce them. Because it tends to be the most available malt, it is used for nearly every other style as well. Can be used as a substitute for any brand of pale malt. This is a base malt which must be mashed. Our regular pale malt, in a 5kg bulk bag. Pilsner malt has a more prounounced, sweetish-malty flavour than pale malt, and is usually a bit lighter in colour. It can be used as a base malt or combined with pale and other malts for pilsners and lagers, and is often an ingredient of many European beers, especially German and Belgian styles. This malt can be used as a substitute for any brand of Pilsener malt, as well as for Bries 2-row pale malt, Muntons lager malt, and Fawcett lager malt. This is a base malt which must be mashed. An intensely roasted unmalted barley that adds a dry, toasty bitterness, body and mouthfeel to dark beers (typically dry stouts). Use sparingly. This is a crystal malt which can be steeped and does not need mashing (but can be mashed along with other base malts). 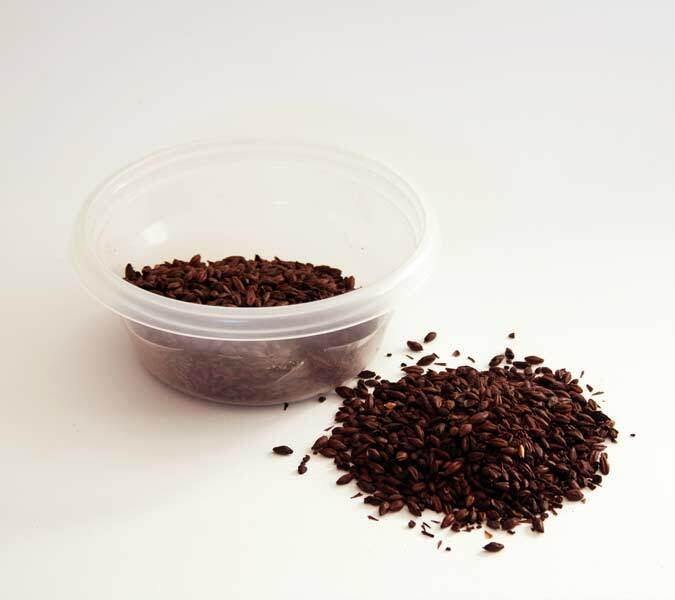 This crystal malt is roasted to a dark finish without having the "toasty" bitterness characteristic of chocolate or black malts. Excellently suited for dark ales, porters and stouts. This is a crystal malt which can be steeped and does not need mashing (but can be mashed along with other base malts). Can be used as a substitute for Baird Dark Crystal malt, and for Caraaroma malt (although it is a little lighter in colour). Vienna malt imparts a richer flavour of malt and grain than pale malt, and adds subtle aromas of caramel and toffee. Vienna malt gives a deeper golden colour to the beer and increases body and fullness. Used in all beer styles, especially Vienna lager but also in a variety of English and Belgian ales, to enhance colour and aroma. Can make up to 100% of the total grain bill. Can be used as a substitute for Briess Ashburne malt, Muntons Mild Ale malt, and any other brand of Vienna malt. This is a base malt which must be mashed. Produces and enhances the typical taste of wheat beers. Wheat malt is essential in making wheat beers such as German Weiss and Belgian Wit. It is also added to barley malt based beers (typically in quantities of 3-5%) to provide the protein that gives the beer a fuller mouthfeel and enhanced head stability. Adds smoothness to British ales. This is a base malt with a lower diastatic power which must be mashed in combination with other malts.